If it seems like almost everyone has come across someone who has or has had breast cancer, there's a good reason for that. It is the single most common type of cancer among American women after skin cancer, and the second leading cause of cancer death after lung cancer. In fact, one case of breast cancer is diagnosed every two minutes. But these days that isn't always a death sentence. As of 2009, there were 2.5 million breast cancer survivors living in the United States. That is the largest group of all cancer survivors. In fact, the 5-year survival rate for female breast cancer survivors in the US has improved from 63% in the early 1960s to 90% today. And, since 1990, overall breast cancer mortality rates in the US have decreased 24%. So as we come to National Breast Cancer Awareness Month, it seems as good a time as any to discuss one (and there are certainly others) reason for falling rates—targeted therapies. To simplify what can seem a complicated discussion, let us divide breast cancer into two groups: estrogen-receptive (ER positive) and non-hormone receptive subtypes (ER negative). A type of breast cancer known as HER2-positive falls into the ER positive category, and that is where we want to focus our attention today. In about 20-25% of breast cancers, the cancer cells overproduce a protein that's called HER2/neu (human epidermal growth factor receptor 2). These proteins are receptors on the breast cells that, in a healthy breast, control how the breast cell grows, divides, and, if need be, repairs itself. But in this form of cancer, the HER2 gene gets overexcited, making more copies of itself than are needed. These extra genes go ahead and tell the breast cells to make too many HER2 receptors, which causes the breast cells to multiply uncontrollably. HER2-positive breast cancers come with some real downsides. They grow faster--and are more likely both to metastasize and to recur--than are HER2-negative breast cancers. But. . there are medicines that have been developed specially to treat these HER2 cancers, medicines known as targeted therapies, and they are part of the newest wave in cancer care. 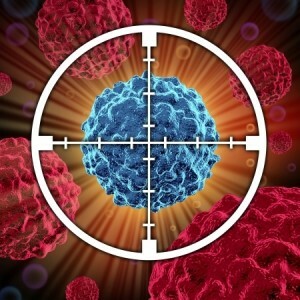 Targeted therapies are a whole new approach to cancer treatment. As opposed to chemotherapy, which may more or less willy-nilly kill 'innocent' cells with the cancer cells, the medicines or treatments that make up targeted therapies attack the specific cancer cells, leaving the healthy, normal cells alone. They have been described as "precision medicines," designed to act like smart bombs, hitting tumor cells directly and reducing "collateral damage" to all other cells. The very first one approved for HER2 positive breast cancer is known as Herceptin (chemical name trastuzumab), and its approval came with much hype--and great hope for the future of breast cancer treatment. Herceptin is known as a (don't panic) monoclonal antibody. All that means is that it's made in a lab to attack specific cancer cells. Way back in 1988, the FDA approved Herceptin, in combination with a chemotherapy drug known as Taxol (used for cancer of the breast and ovaries and non-small lung cancers). It was initially approved to treat metastatic cancer, which is cancer that has spread from the breast to other sites in the body. It was additionally approved as a stand-alone treatment for patients who had received prior chemotherapy treatments. The original studies were run on 469 patients, with one group taking Herceptin plus the chemotherapy drug Taxol, used to treat cancer of the breast, ovaries, and non-small cell lung cancers--and the other group taking Taxol alone. 33% in the first group had some decrease in tumor size, as opposed to only 15% taking only Taxol. Additionally, median duration response (defined as the time from which the cancer responds to treatment to the time it begins to grow again) was seven months longer with the Herceptin/Taxol combination than with Taxol alone. As a targeted therapy, Herceptin goes straight for the tumor cells. It searches out and attaches itself to the HER2 receptors on the surface of the breast cancer cells, and thereby blocks them from receiving any growth signals. By thus blocking the signals, it slows--or stops--the growth of the cancer. And, again, as a targeted therapy, it does not impact non-breast cancer cells. The response to Herceptin's appearance at the time was beyond enthusiastic. Doctors were quick to call it a 'wonder drug.' And in the New England Journal of Medicine, one Dr. Gabriel Hortobagyi wrote in an October 20, 2005, editorial, right before FDA approval, that the latest trials, were "not evolutionary but revolutionary.” It was possible, he believed, the drug was "maybe even a cure" for breast cancer. And its promise kept growing. The results of three trials published in 2005, using Herceptin as adjuvant therapy, meaning treatment given on top of the main treatment, indicated that the drug might actually reduce mortality by 33% and might half the rate of recurrence. So it was no surprise that in 2006, the FDA expanded its approval to use on women who had just had their breast tumors removed by surgery, becoming a primary therapy. A certified blockbuster, its estimated worldwide sales in 2012 were $6.08 billion. However, for all of its promise--and for all it does--it was clear as time went on that Herceptin didn’t really seem to be a cure for cancer—and there was room for other treatments in this targeted therapies market. So more came. In 2007, GlaxoSmithKline's Tykerb (lapatinib) was approved, in combination with chemotherapy drug Xelodo (used specifically in the treatment of metastic breast and colorectal cancers), for patients whose cancer had metastasized and, specifically, whose cancer had progressed--meaning the drugs had failed-- on previous treatments, including Herceptin. Tykerb works quite differently than Herceptin. Rather than targeting the HER2 protein on the external part of the cell, Tykerb actually enters the cell and blocks its functioning from inside. Because it uses such a different mechanism, it is ideal for patients on whom Herceptin has failed. The early results of the clinical trials were presented at the 2006 meeting of the American Society of Clinical Oncology. In the trial 160 women who were no longer being helped by Herceptin were given both Tykerb and chemotherapy drug Xeloda, used specifically in the treatment of metastatic breast and colorectal cancers, while 161 received only Xeloda. For the first group, the median time before the tumors started to regrow was about eight and half months. For the second, it was four and a half months. Tykerb's use was significantly expanded in 2010 when the FDA approved it in combination with chemotherapy drug Femara (used to slow the growth of breast, prostate and uterine cancers) as an all-oral, first-line treatment for those in the metastatic phase--meaning doctors no longer had to wait until other therapies had failed before utilizing the medication. The pivotal study was based on 219 women, with one group treated with Tykerb plus Femara, a chemotherapy used to slow the growth of breast, prostate and uterine cancers, and the other receiving only Femara. Now, to understand these results requires knowing a little cancer research phrase: "progression-free survival" (called PFS). The National Cancer Institute defines this as the length of time during and after treatment that the patient lives--still having the disease, so they haven't been cured--but without getting worse. In this study, those receiving the mixture experienced a 5.2 month increase in average PFS as compared to women receiving Femara alone. But despite such research results, Tykerb has never reached the blockbuster status of Herceptin. As of 2012, its total global sales were only $362.5 million, a mere fraction of Herceptin's. The next therapy, which arrived with much fanfare, was Genentech's Parjeta (pertuzumab), approved by the FDA originally in June of 2012 to treat laggressive, late-stage metastatic cancer. Drug maker Genentech claimed the drug "significantly delays the time until women with very advanced cases of breast cancer gets worse." Its modus operendi might sound very familiar: It targets cells that make too much of a protein known as. . .HER-2. However, it is only approved for use in combination with Herception (as well as chemotherapy), again in those with HER2-positive breast cancer. Just like Herceptin, Perjeta attaches itself to the HER2 receptors on the surface of the breast cancer cells, thereby blocking them from receiving more growth signals, and slowing or stopping the growth of the cancer. Because it targets a slightly different area on that HER2 receptor than Herceptin, however, the two drugs are complementary. The original clinical trial involved 808 patients randomly assigned to receive Perjeta with Herceptin and chemoterhapy drug Taxol (docetaxel) or placebo in combination with the other two. The trail had not artificial end: it went on until the disease progressed, there was drug toxicity, or a subject withdrew consent. Remember our PFS? So with the Perjeta combo there was a 6.1-month improvement in median PFS over placebo. Genentech has pushed for further uses, however, and just this past September the FDA panel of cancer experts voted, in a nonbonding recommendation, that, because the benefits of Perjeta as an initial treatment outweigh its risks, the FDA should consider approving it as the first drug to use in the treatment process--that means before surgery. The FDA plans to decide by October 31st. A study--run by maker Genentech--found that women who were initially treated with Perjeta were 18% more likely to be cancer-free at 12-weeks than women who received various combinations of older drugs. In terms of the bottom line? In June of 2012, Fierce Pharma predicted high--exceedingly high--earning potential for Perjeta. Claiming the treatment was a potential blockbuster, it said analysts were estimating it could earn between $600 million and $1 billion-plus. And that was before the latest news this past month. In February of this year, Kadcyla (ado-trastuzumab emtansine), was approved by the FDA, again, like Perjeta, orginally, for late-stage (metastatic) breast cancer, and patients who had already been treated with Herceptin and chemotherapy (specifically Taxol), and who had failed under that treatment. That makes it the fourth approved drug targeting the HER2 protein. Kadcyla, made by Roche, combines Herceptin (which, with chemical name trastuzumab, provides the 't') with an old chemotherapy drug known as emtansine (or DM-1). In fact, to create the new drug, scientists actually attched chemotherapy molecules to Herceptin, hanging them, as one writer describes, "like ornaments on a Christmas tree." So when Kadcyla is infused into the body, Herceptin does its job of searching out and attaching to the HER2 receptors. But now it's carrying a toxin, which it releases directly at the cancer cell. The toxin then enters the cell, killing it. Kadcyla was evaluated in a study of 991 patients, with one group randomly assigned to receive Kadcyla, and the other to to receive Tykerb with Xeloda. Those who received Kadcyla had a median progression-free survival of 9.6 months as opposed to 6.4 months in those receiving the Tykerb/chemotherapy mixture. Median overall survival rates were 30.9 months in the Kadcyla group as opposed to 25.1 months in the other. Of course it's too early to tell exactly how the drug will perform in the market, but a Bernstein analyst projects sales of $660 million by 2016. Clearly there's a lot of promise in the future of breast cancer treatment. But, despite initial excitement, we have yet to see one real miracle drug, even for the subset of breast cancer patients who are HER2 positive. Maybe, by next year’s Breast Cancer Awareness Month. . .